Hey Nikos - love the graphic in your post above! I had not found that feature. That certainly makes things much easier! I have been refining the drawing and a newer version is attached and inserted below. I too and working on the chalk feeder for the S2! Will keep you posted. 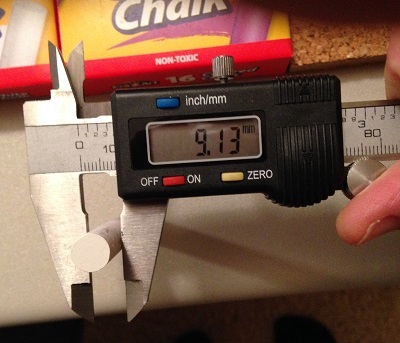 Edit - Standard Chalk (here in the U.S.) is 9.13 mm in diameter and fits in the pen port with room for a thin feeding tube or perhaps the tube would just go to the shoulder in the the pin port and use the lower pin port without a tube from there on. Nice drawing Whit! What program did you use? @ erco - Thanks! AutoCAD - back to my roots as an architect. You have to work pretty hard to keep up with Nikos! And use a lot of plywood to keep up with you! See the photos and test video below. 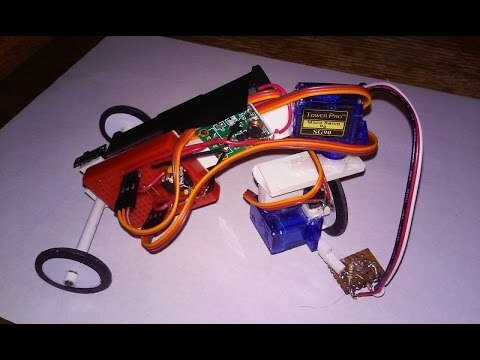 This is just the proof of a simple device that anyone could make without special tools. Let me know what you think - Enjoy, improve and re-post your ideas! 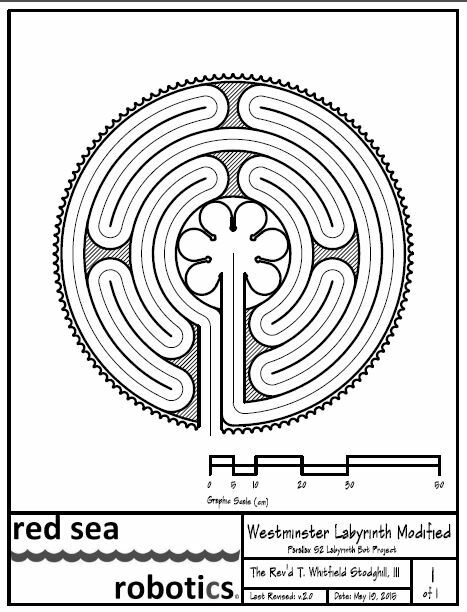 Attached are the pdf s of the latest drawings (version 2.2) for the Westminster Modified Labyrinth. Nikos - these are the angles as measured in my drawing. Also attached is the line length in a ridiculously precise number (this could be simplified obviously - been having a bit too much fun re-learning AutoCAD! (just setting up things took a while to remember!). I will enter this info into the Excel Calculator and then into the the GUI program maker and see what it produces! Going to also try to plot a full size copy of the drawing and see how close the S2's path as programmed come to that of the drawing. 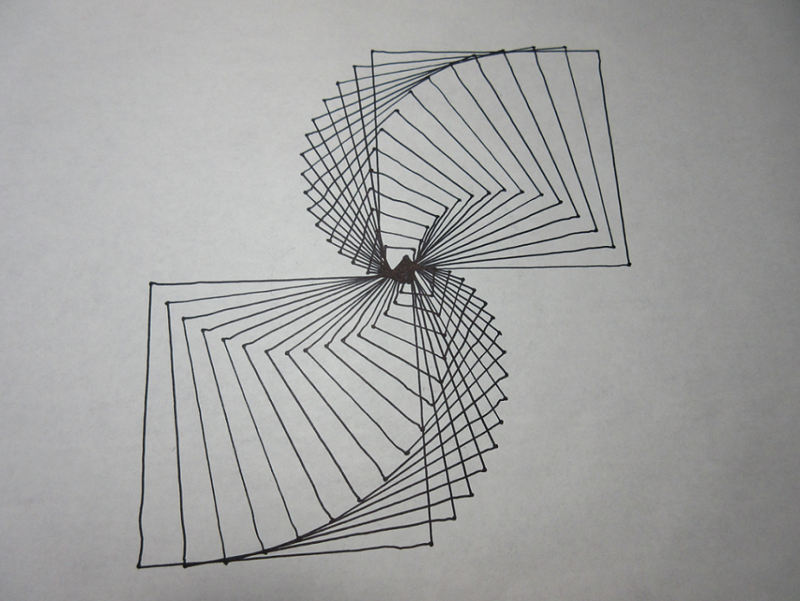 I will try to import my drawing into Geogebra and redraw it there - when I get the chance. Learning a lot and having so much fun. 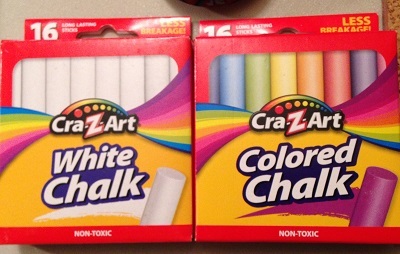 Can't wait to see your version of the chalk feeder. Another idea more suited for the Artist Robot (or something like it) would be to draw the Labyrinth itself. Laying out a Labyrinth to paint on a parking lot surface (etc) is lots of work. 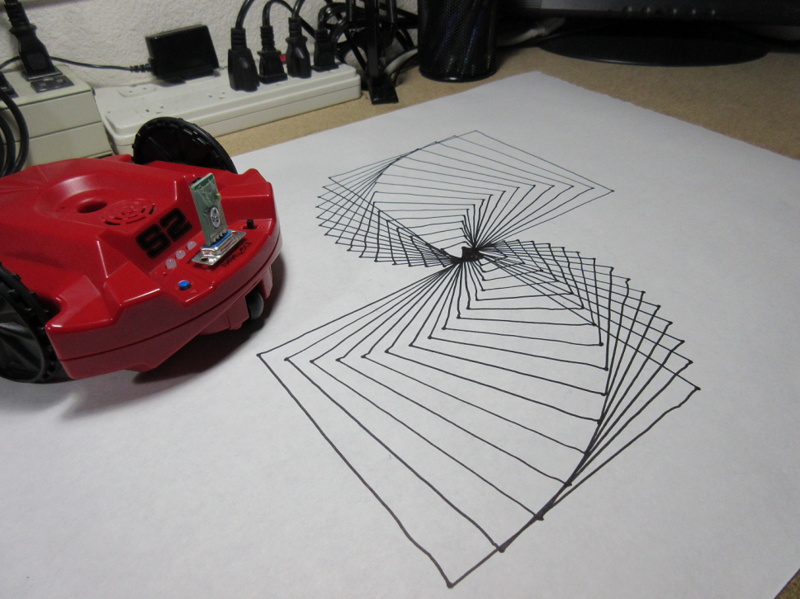 It a robot could draw it - that would be really neat. 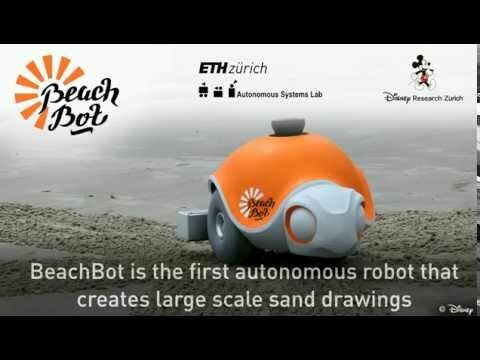 I was having a conversation with a fried and the idea of tracing the labyrinth in the sand - so it could be walked - also came up - think something similar to Disney's Sand Doodling Robot! 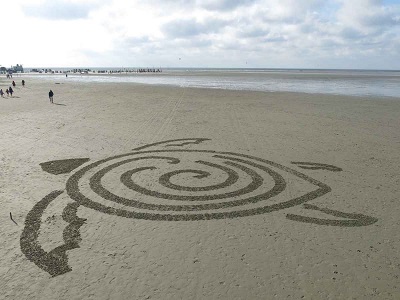 Be sure to check out the Spiral in the Sea Turtle Nikos! @Nikos - I've been studying your new Excel spreadsheet - very cool - I like the multiplier (looks like a scale factor of 1 would just give the basic formula). I've made a couple of changes, and notations and added your drawing too. I'm calling it Nikos G's Better S2 Calculator! This will be fun to use with students! Edit - Updated Calculator attached. Okay - sorry folks - Code removed - see below - I was just trying to use this and obviously had some things fouled up! Really impressed with the work you and Nikos have been doing. Iv'e got to put my S2 back together and join the fun! Dive into the pool Jim - the water and the scribbling are fine! Your chalk feeder design is very cool and practical! You totally changed my initial plans and I'm trying to create something very similar to your design! The problem is that the space between chalk and s2's tube is limited. So it is very difficult for my 3d printer to print a such a thin accessory. I have a solution IN MY MIND, but I must totally remove the s2's tube (and open further the hole) and replace it with a new. Do you have any excel file with the new data for the westminser labirynth? 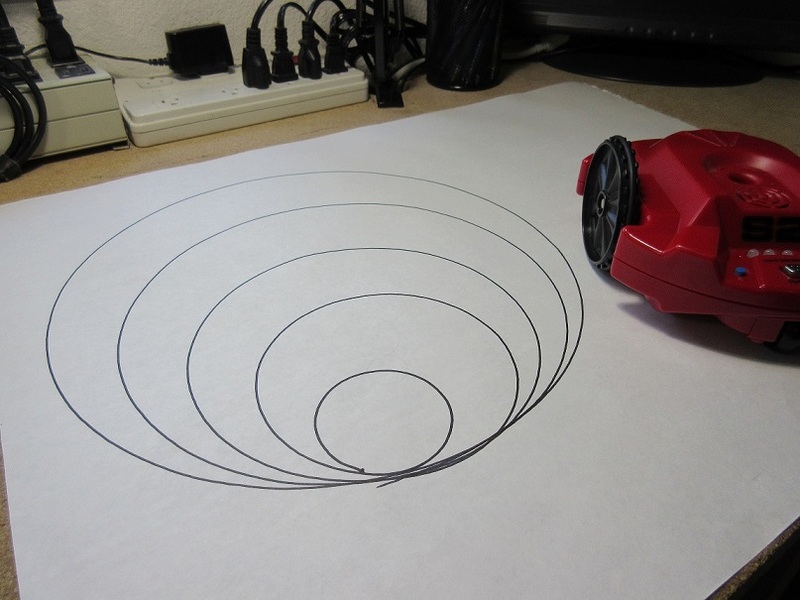 I will also try to create the awesome "turtle spiral" from the "Disnay sand robot". Of course I can make it easy with my very first Excel file from the project "Scribbling sport team logos with S2, using Microsoft Excel", but I want to do that only with GUI. Meanwhile , this is for Carol Lynn Hazlett! You can check the next S2 GUI code with your S2! @Nikos - Thanks, but I just was playing with this I I think I messed some things up! I have removed the file above. I did like the small aesthetic changes and I see your point about the color for pi - will try again and post when I have something better! What I liked best about your new design was that the table itself had the formulas present to make the calculations. Rather than using the calculator above and then transferring the number into a "dumb" table. I like the + and - for the direction of turn too. I wish there was a way (and I am sure there is!) to have the calculator get the wheel speeds in the proper relationship (a vs. b) depending on the turn direction symbol. I also wish a "smart" table could get Lines and Arcs to the correct calculator! I can dream - I guess. As I said - this may be possible - but it is past my Excel skills. Too much to learn and too little time! My idea was to be simple enough for folks with out tools to make. With my design there is nothing that keeps the chalk in other than the weight of the S2 and once the Chalk is worn to length smaller than the "ground clearance" under the S2 - it would come out. 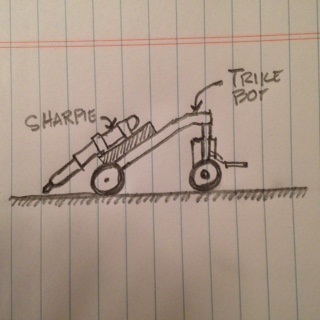 Also a rubber band that is too strong with actually push hard enough to raise the S2's wheels off the running surface. I also thought of a spring to push the chalk down though the tube, but did not have one the right size (again the right amount of force would be critical. It would also require a cap on the tube to retain the spring at the top end of the tube. 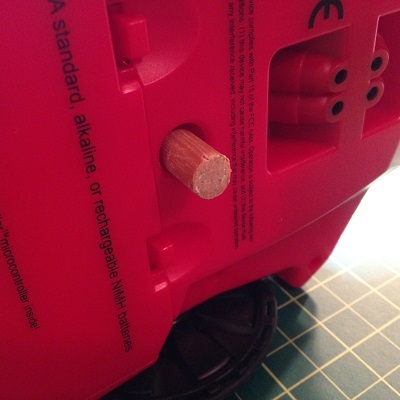 Since the feeder tube is a friction fit in the pen port - if the rubber band or spring is too strong the tube will launch out of the pen port like a missile! I know from experience. ;-) I also though of a simple weighted plunger to push the chalk down this has the advantage of not lifting the S2 or ejecting the feeder tube and is very simple and might look interesting too. I will try to make some sketches that make some of this clearer. The tube thickness would have to be pretty thin in the bottom part of the pen port to still allow the chalk to pass properly. I tried some thin plastic (a folder cover, but never got it just right... That is why I went with the other approach for my simple design. My approach also has no way to raise or lower the chalk - of course. 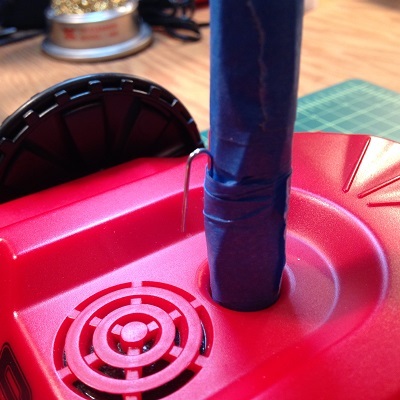 The simple version is pretty much like putting a pen in the pen port - by the way just putting the chalk in the pen port does not work well - it is so light - you really need a bit of pressure on the chalk - hence the rubber band, spring or weight idea! Have been working on this and thought I was done, but I had some errors - I will get it fixed and posted - it will be with arcs and angles according to my latest drawings. I agree - there are ways to do it, but trying to draw it with the GUI is real trick! 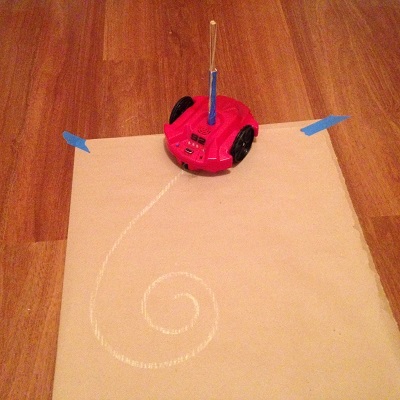 The Disney Bot uses tracking pylons at the perimeter to locate the bot precisely - not just odometry as we are attempting - our way is in many ways much harder especially the bigger the drawing gets - as regard accuracy! Thanks for all the help and encouragement! Keep up the great work. I still owe you a video of my S2 running some of your code too! I have not forgotten. The main challenge is to find the right force in order to keep the chalk in touch with the ground without lift up the entire S2! With the "artist" I hadn't that problem due to its weight. I put a small piece of chalk inside the tube without nothing (no paper no plastic only the chalk) and on top I put a screwdriver in order to press the chalk down. So I had no danger to lift the s2 up. 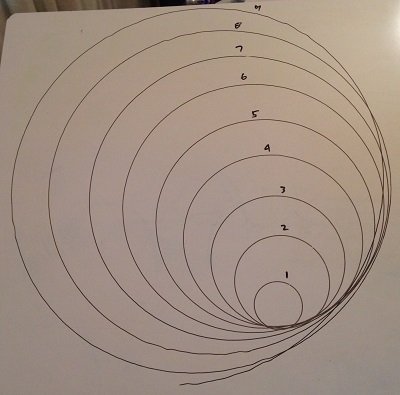 By the way - attached is a photo of 9.25 Circles! I was scribbling on my white board. The lumpy lines are where the wheels ran off the edge and lead to a bit of misalignment!. Ran out of room before I completed the fun 10 circles - so I numbered what I had for reference. Will repeat this again on regular paper - Maybe with a Nikos "Special" Chalk Feeder! This is special for you! Here is an image...Wonder how big this doodle really is? Bravo erco! You da man! Challenge meet! 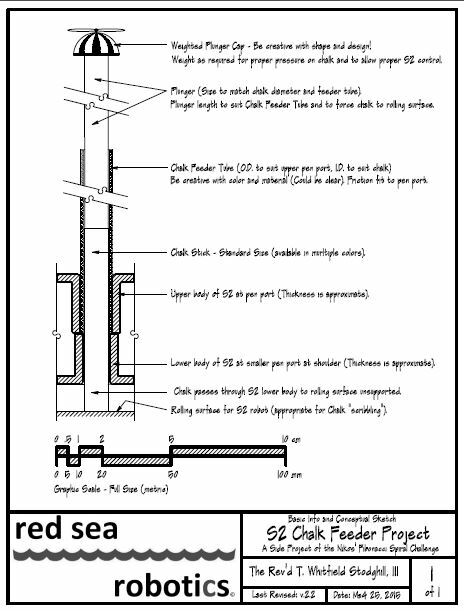 Attached is the Basic Info and Conceptual Sketch for the S2 Chalk Feeder v.2.0 - this is a side project of the Nikos' Fibonacci Spiral Challenge. 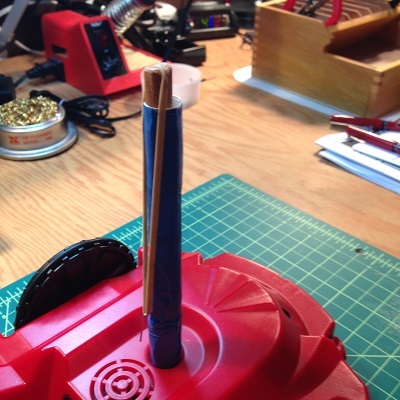 Two additional concepts include putting a cap on the feeder tube that confines a spring to apply pressure to the chalk and next my plunger and rubber band rig as shown above. 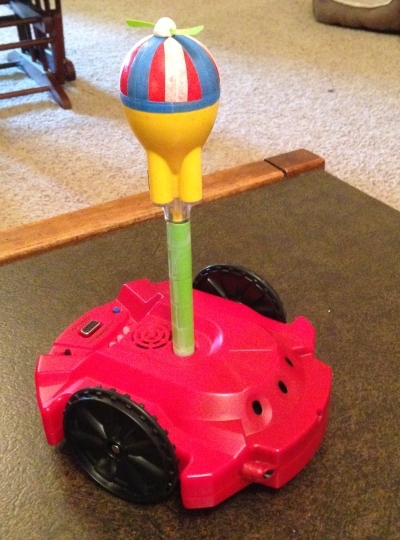 This sketch document the weighted plunger, which Nikos achieved with a screw driver and no tube at all. A simple and elegant "erco-esque" solution. pdf of the AutoCAD drawing is also attached. Full size on 8.5 X 11 sheet. Anything I post here (for my part) is completely open for anyone to modify or use as they wish! Edit - Updated version added that corrects some typos and scale issues. First fake Fibonacci, finally! No pen holder yet though, some imagination is required. I noticed that your Fibonacci spirals were roughly 720 degrees, that is two complete revolutions before the radius got huge, nearly straight. So I calibrated my steering routine for exactly 2 left revolutions, straight, then 2 right revolutions, then stop on a dime (OK, a piece of tape). The repeatability surprised me, all due to my hi-resolution 1 PPR wheel encoder! 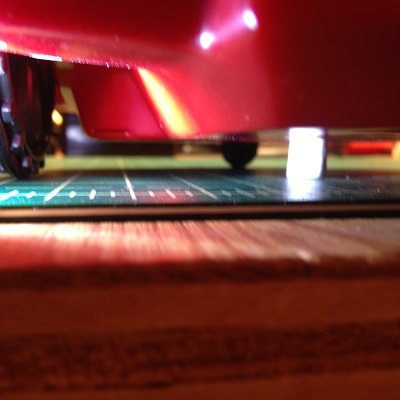 Trikebot simply counts wheel revolutions and increments the servo a bit every time the encoder switch closes. It seems that it is easy but it isn't !!! (Especially with a small Trikedot)!!! Here is a second test video of the S2 Chalk Feeder System (like the version in the drawing above). 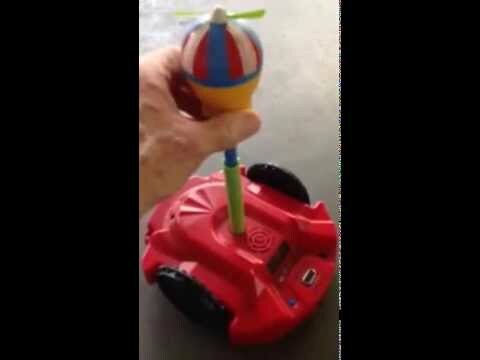 This method steals Nikos' weighted plunger idea with a twist! Hope you like it. Code is the Ten Circles Illusion posted above by Nikos (only ran a little bit of the full code). In this simple build - nothing raises or lowers the chalk - it is just a weighted gravity feed. When the S2 is picked up, the chalk simply drops out the bottom (as you will see). Very simple. The tube and weight can be made of anything. You just have to play with what works best in you situation. Sorry about the vertical video! I know better, but was not thinking...Too pleased with showing off my Propeller Beanie - I guess! Here is a photo too. Silly, but fun! 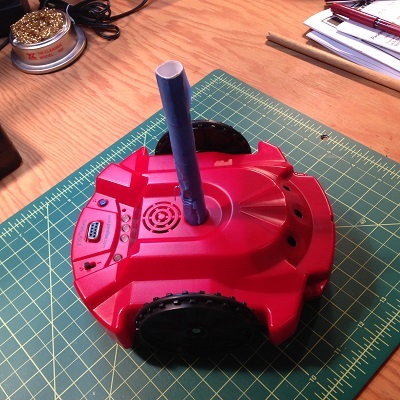 Agreed, although I think the drag from a pen would cause traction/repeatability issues in my tiny Trikebot. I'll have to modify a fair amount so that will have to wait a while. 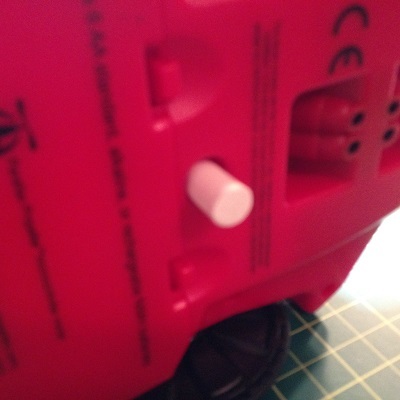 Need to add some weight fore & aft, and cut my hardened steel ejector pin axle in half to put a pen holder there. It's never easy! 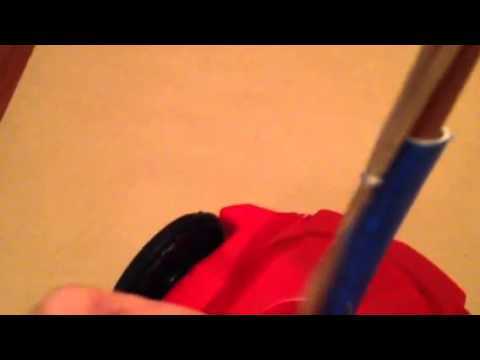 The best and most elegant solution is the the weighted plunger on sheet one - as Nikos demonstrated with his screwdriver and as recorded in my video above. 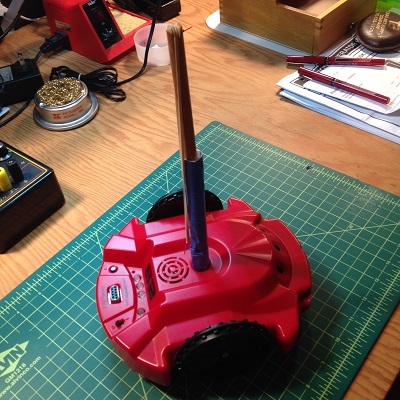 The plunger's weight still needs to be just right, but the problem of raising the S2 is eliminated. All of these are easy enough for students to rough out quickly and they get to have the fun of actually doing a "hack" of sorts. Building anything is always a learning activity! Trail and error, goofs, etc. Enjoy and post your solutions here too! All of this (Chalk Feeder, I mean) will work with the new S3 as well and the old original blue. 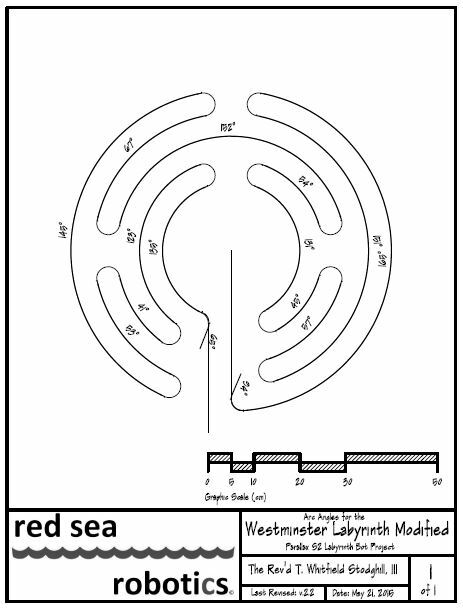 Next - I am back to the labyrinth bot and I owe Nikos a Excel spread sheet for the S2 labyrinth path for the Westminster Labyrinth - Modified. Okay guys, I used Nikos code for this try. 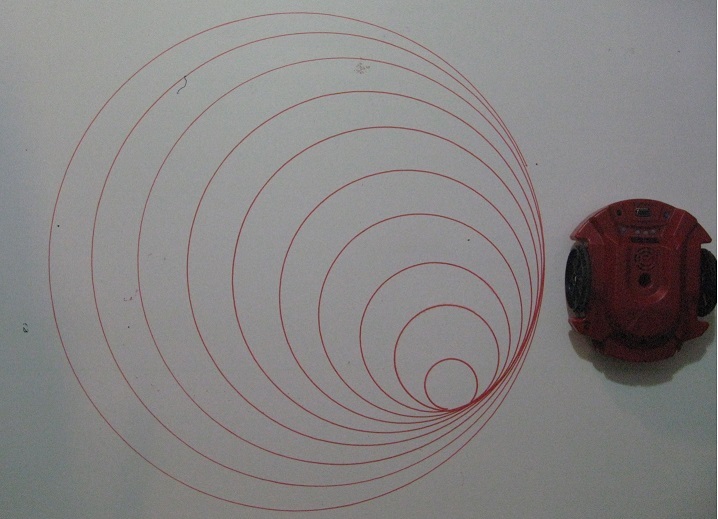 Both the Fibonacci spiral and the ten circles spiral worked fine. Now I have to do a lot of reading and dust of my TI-89 and design one of my own design. I had to change the ten circles to five as I am using butcher paper until I can buy some bigger paper. 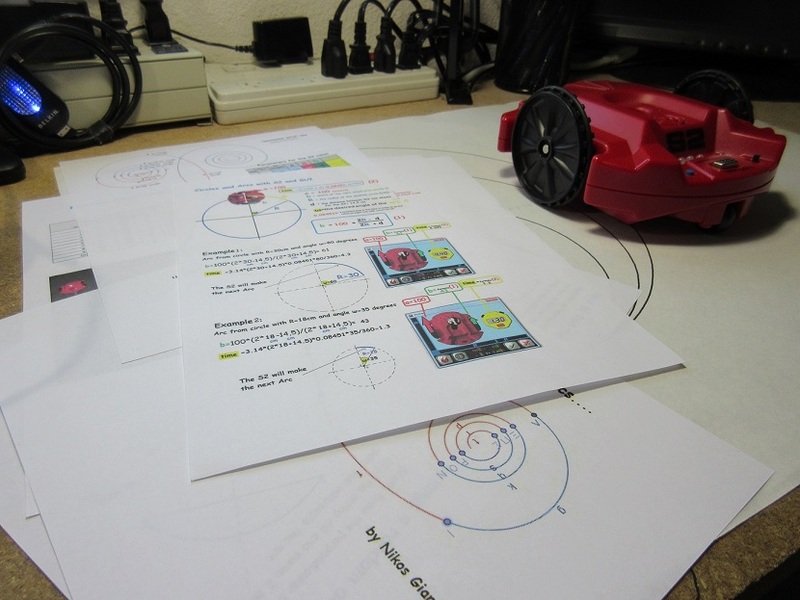 In the video the gap in the beginning circle is me juggling camera and robot and putting pen in a little too late. 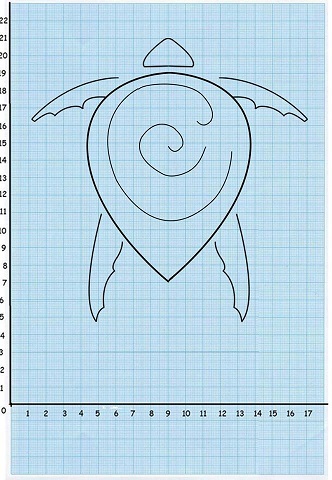 I think I may try to play around with some spiral designs in MatLab to see what I can come with that will be different and not copies of what you guys already did. Like I have said before, almost everything I do I am in over my head at the start! Great video Carol! Glad you are in the hunt. Whit: You ARE going to honor Carol's offer and let her do your hair at our Robothon sleepover come October, yes? @erco - I want her to program her S2 to scribble some hair on my head with a Sharpie! First attempt at "something". I was going for a sort of mobius effect. Need to clean up the middle or change how I drew it so there is less going on in the middle. But, pardon the pun, there is a learning CURVE! Can't get away from them even here Whit! I think I may try relearning Spin as I haven't found the way yet to make iterations or incremented loops with the GUI. Any hints guys? 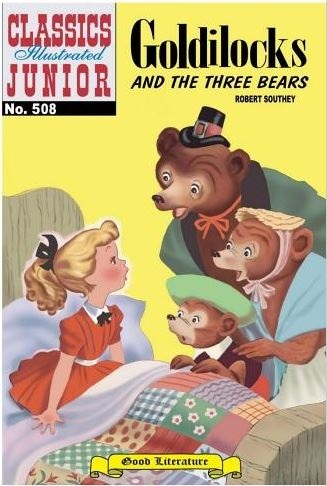 No URL comes up for my attached images. In the area where my attachments are uploaded the thumbnails of the images are all pictures of a question mark leaving me only the option of putting them inline with the text. You have done an AMAZING spiral!!!! I show the image for you. (As said Whit before, just put the link between two IMG tags, the second with a "/"
and the result is your beautiful drawing! Can you describe please in two words the steps of your algorithm?